For this revival, the drama's sekai being the Taikôki, it was decided to use the real names for the historical figures. The spectacular "Onna Goemon" scene was the opening act of this drama. December 2014: "Igagoe Dôchû Sugoroku" is staged as a tôshi kyôgen (5 acts, 6 scenes), including the rarely-staged "Fujikawa Shinseki" and "Okazaki Yamada Kôbê Sumika" acts (they were staged for the last time more than 44 years ago, in September 1970 at the National Theatre), at the National Theatre with Nakamura Kichiemon as zagashira [more details]. 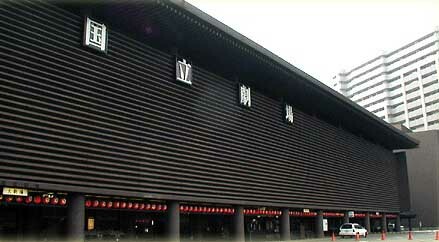 March 2017: "Igagoe Dôchû Sugoroku" was staged as a tôshi kyôgen at the National Theatre. The core of this revival was "Okazaki". The third act, commonly called "Engakuji", which was staged for the last time in February 1931 at the Meijiza, was revived as well [more details].